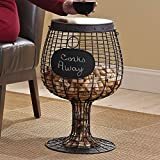 This cool new Barrel Cork Catcher Accent Table literally shows off how much you love wine by the number of corks you have tossed inside. 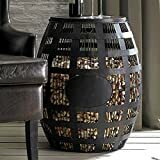 This unique accent table is handcrafted from black-finished metal and has a hinged wooden top that opens up to insert the corks. 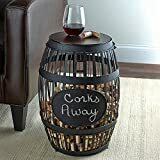 It can hold hundreds of corks inside the cage, so invite all your wine-loving friends and family to open up a few bottles and contribute to the personality of this table and the memories it will hold.